Just because you’re grown doesn’t mean you’re immune from certain illnesses. Vaccinations are important in staying healthy as an adult. Adults aren’t good about getting vaccinated. Many adults don’t know they need adult vaccines. Flu: All adults should receive a flu shot once a year. It can reduce the risk of flu by up to 50%. How well it works depends on the type of flu that is spreading. It takes about two weeks after vaccination to protect against flu. The best time to get vaccinated is early fall. This is before flu season begins. The CDC recommends that people get a flu vaccine by the end of October. While getting the vaccine earlier is better, getting it later is still effective. Getting the vaccine even in January or February can still provide some protection. Tdap: This vaccine protects against tetanus, diphtheria, and pertussis. These bacterial infections can be prevented with a vaccine. It’s typically given at age 11 or 12. If you did not receive it as a child, you need it as an adult. Td: This vaccine protects against tetanus and diphtheria. These are bacterial infections. If you got the vaccination as a child, you need a booster dose every 10 years. If you haven’t had one for a while, get one if you’ve experienced a severe or dirty wound or burn. Everyone needs a Td booster dose every 10 years. Zoster: This vaccination protects against the shingles virus. The shingles virus causes a painful rash. It appears as blisters that develop on one side of the body. It often appears on the face or torso. It can result in long-term pain even after the rash goes away. Older people are most at risk for the virus. The CDC recommends adults 50 years and older get two doses of the vaccine. The doses should be 2 to 6 months apart. Pneumococcal Conjugate: This vaccine protects against pneumonia. Pneumonia is a serious bacterial infection. It spreads from close, person-to-person contact. The infection is common in adults. Beyond children, adults 65 and older are urged to get the vaccine. It also may be recommended by your doctor that you get this vaccine if you have a chronic condition, such as diabetes or COPD. HPV: This vaccine protects against human papillomavirus (HPV). People who are sexually active are at risk of HPV. The vaccine is given to pre-teens. However, adults can benefit from getting it later in life. The vaccine requires three doses. If you only got one or two doses as a child, you need still need the final dose. Meningococcal: This vaccine protects against meningococcal disease. This bacterial infection affects the lining of the brain, spinal cord, and bloodstream. It is spread through coughs, kissing, and living in close quarters. Your doctor will tell you if you should receive this vaccine. 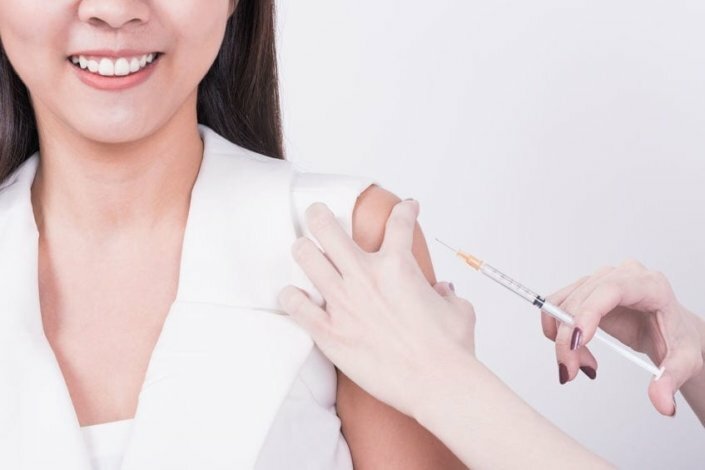 MMR: This vaccine protects against measles, mumps, and rubella. Adults born after 1957 who never got the vaccine should get it. Varicella: This vaccine protects against chickenpox. Adults who have not had chickenpox or the vaccine should get it. Hepatitis A: This is a highly contagious liver infection. It is spread through contact with feces (poop). Adults who are at risk for the infection should get the vaccine. Risk factors include living or traveling to areas of the world where the infection is common, exposure to childcare centers, and living with someone who has Hep A. Hepatitis B: This is an infection of the liver. It is spread through contact with blood and bodily fluids. Adults exposed to certain risk factors should get the vaccine. Risk factors include jobs that expose you to others with the infection, a diagnosis of diabetes, end-stage kidney disease, chronic liver disease, or drug/sexual behavior that increases risk. Hib: Haemophilus influenzae type b (Hib) is a bacterial infection. It infects the lining of the brain and causes meningitis. Adults with certain risk factors should get the vaccine. This includes people with a diagnosis of sickle cell disease, HIV/AIDS, removal of the spleen, bone marrow transplant, or cancer treatment. Most private health insurance plans cover the cost of vaccines. Medicare and Medicaid will cover certain vaccines. This includes the flu, pneumococcal, and Hep B vaccines. Other portions of the plans may cover zoster, MMR, and Tdap vaccines. If you are pregnant, check with your doctor before getting any vaccine. If you can’t remember which vaccines you’ve had, ask your doctor about repeating the vaccine or the need for booster doses. Most vaccines have few side effects. The negative effects of the diseases itself is far worse than the vaccine. You may experience slight pain and redness near the vaccine injection site. How do I find out which vaccines I’ve already had? If I had chickenpox as a child, do I still need the vaccine? If I had shingles, do I still need the vaccine? Is it too late to get a vaccine after I’ve been exposed to a disease or infection? National Institutes of Health, Medline Plus: Adults Need Vaccines Too!